The award ceremony for the 2018 UNIST Math Competition for Freshmen was held in the Natural Science Bldg. (108) at UNIST on November 27, 2018. 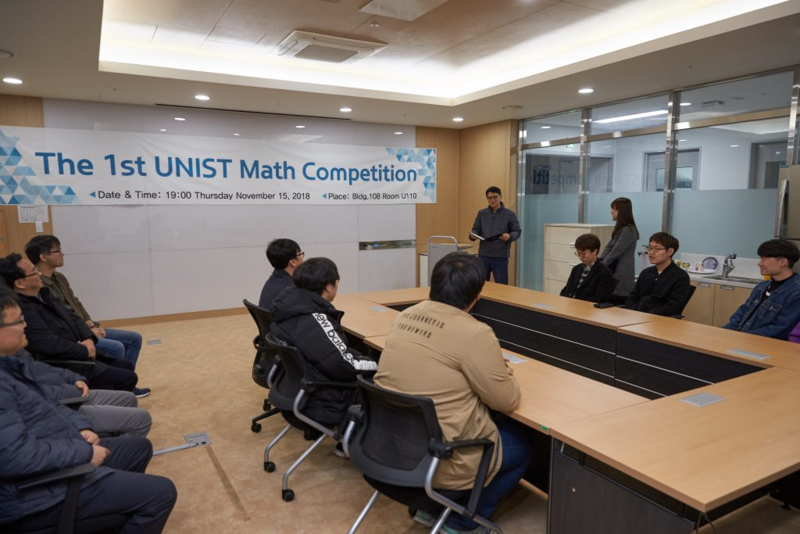 UNIST held an award ceremony to celebrate and recognize the individuals parcitipated in the 2018 UNIST Math Competition for Freshmen, which took place on November 15, 2018. 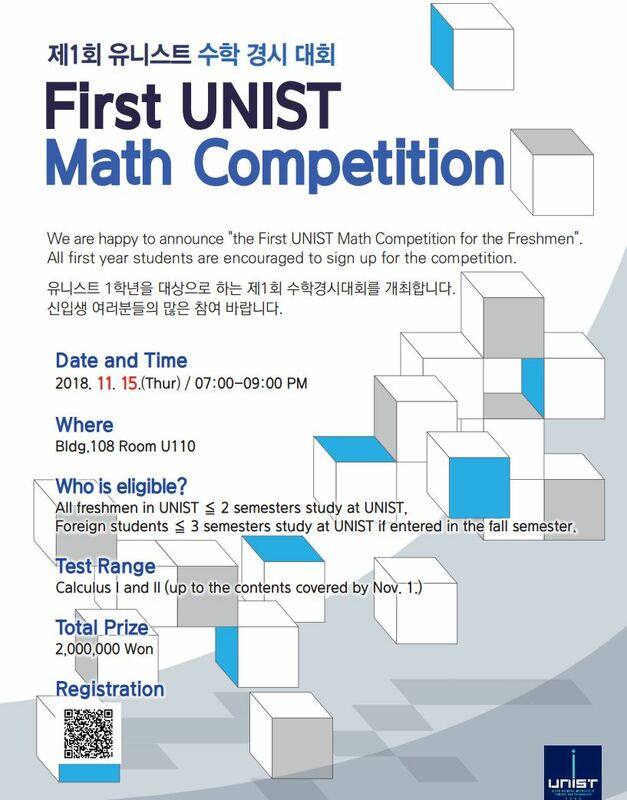 Organized by the Department of Mathematical Sciences within the School of Natural Science at UNIST, this is the first competition held in the history of UNIST. The ceremony, held in the Natural Science Building (108) on November 27, recognized seven outstanding students in the Division of General Studies at UNIST. This year’s grand prize has been awarded to JongMin Choi, as he earned the the highest score. Both BeomHo Kim and SeHun Bang won the silver prize. JaeHyeok Lee has been awarded the Bronze prize, while JoonBeom Kim, Younghun Jung, and Sihyeon Kim won the participation award. 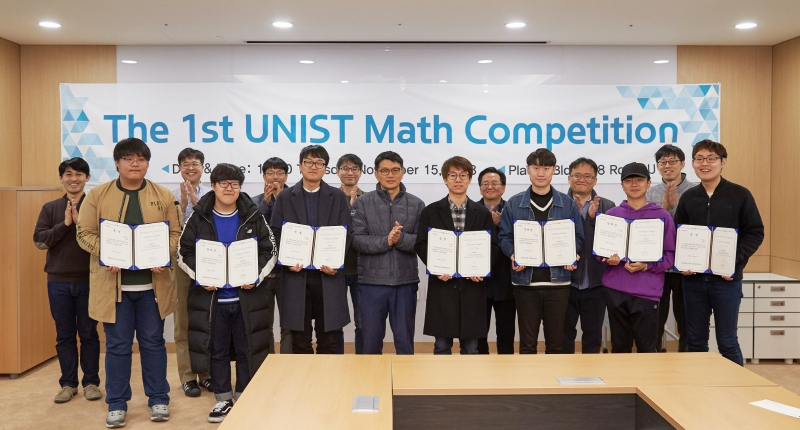 Along with the individual awards, there was also a monetary prize of KRW 2 million, which has been raised by the faculty members in the Department of Mathematical Sciences at UNIST. 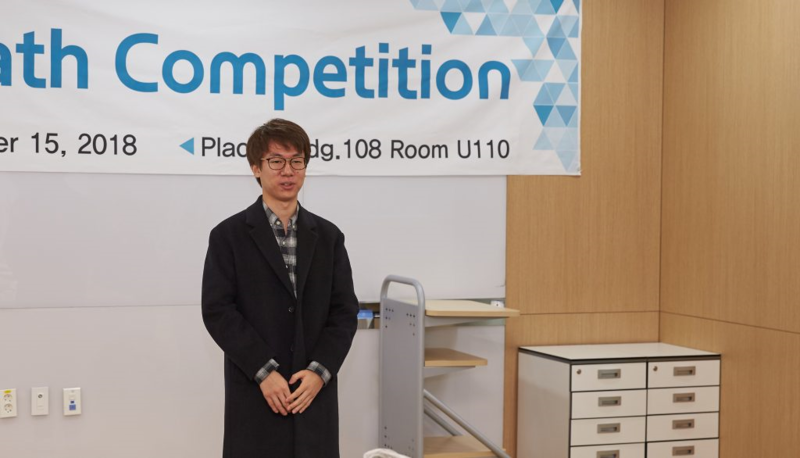 This year’s grand prize has been awarded to JongMin Choi in the Division of General Studies at UNIST. The award ceremony, held in the Natural Science Bldg. (108) at UNIST, was attended by the award recipients and professors of Mathematical Science. The ceremony has been also attended by Chair Professor Kook Joe Shin, Chair Professor Sungpyo Hong, and Chair Professor Hong oh Kim in the Division of General Studies at UNIST. In particular, Professor Hong, who majored in mechanical engineering and later changed to mathematics, notes that “Mathematics is the only armor that will keep you safe from the fast approaching Forth Industrial Revolution”.